It has been a good few days. All of our patients are doing well. The Eagles are alert and eating well. #008 is tolerating the CA EDTA but is unhappy about it. Being unhappy is OK as long as he gets better. I love to be their friend but it is not mandatory. #007 is back on treatment and is eating well also. #008 is alert and showing improvement. We have a new patient admitted about 9:30 Tuesday night. It is a Spruce Grouse. They are a threatened species in Wisconsin. A bird of the far north, they are a little smaller than our more typical Ruffed Grouse. Our new patient is a female. She has the brown coloration which is meant to camouflage. Camouflage is important especially in gallinaceous birds like grouse that nest on the ground. It works well to hide the incubating female from predators especially when nesting and soon after chicks are hatched. The more colorful male wears a black and white pattern on his feathers. 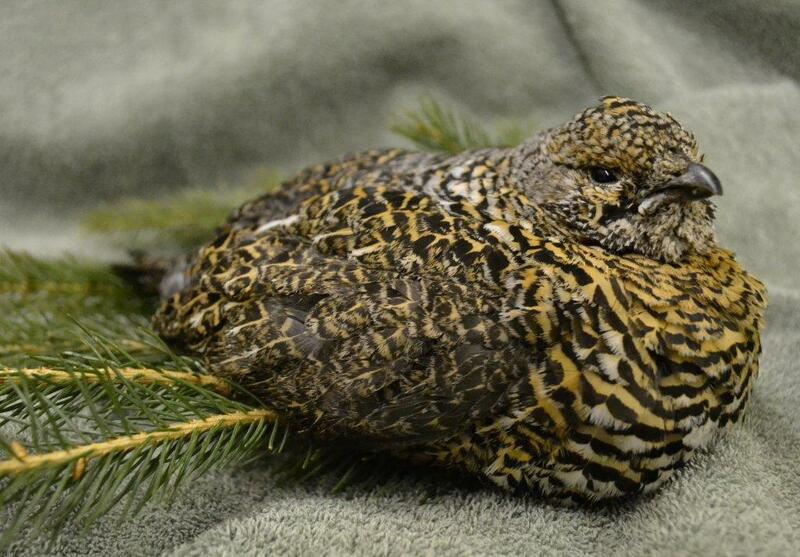 The female Spruce Grouse rests with evergreen bows which help to make her feel at home. 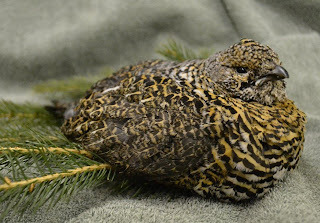 Our Spruce Grouse was caught by a dog. Often it is domestic animals, dogs and cats, which catch and kill sensitive wild species. It is not the animal's fault of course, but the owners that allow them to run free. She has a serious injury to her abdomen. Her left leg is broken. The person that found this bird saw her earlier in the week but didn't realize she was injured. The infection, from the dog’s mouth, had a chance to take hold. We have her on antibiotics and fluids. We have great hopes she will make it. Juliet my red-tail is doing well today. It is the first time I feel optimistic about her recovery. I found her standing on her perch again today; a sign she is feeling better. Tomorrow we have a group of Japanese vet students visiting from UW-Stevens Point. We are looking forward to meeting them!